which is your favourite bar, pub or discoteque? Nightlife in Nha Trang is very interesting. There is a plethora of bars. Which is your favourite bar? These are the most centrally located and the most visited by tourists. It is situated right on the beach near the Ana Mandara Resort. Restaurant, night bar and military museum with real old black&white photos devoted to Pacific fleet USSR. Old soviet uniform and the weapon for photographing of visitors. There are three floors with central air conditioning, three toilets, children's corner, verandah, banquet room, disco-bar and BBQ. The restaurent offers European, Russian, Chinese and Vietnamese cuisines. The head cook and the satff are Russians. You can buy there beer and real Russian vodka with a special offer durinh happy hours. In the restaurant you can order "Best from the West": jacket potatoes, full English breakfast, bacon and eggs, real burgers, salads, steak and chips, shepherds pie, real hamburgers and more. Also, Shorty's has an extensive library of books available for sale or exchange. This bar is situated in the south of Nha Trang (across from the Evason Ana Mandara). In this bar you can eat breakfast, lunch and dinner. Eat and drink while enjoying views over Nha Trang bay. Happy hours 18:00 to 22:00. Whisky - Rum - Vodka - Gin - Tequila Buy-one-get-one-free. It is a combination of Dive Shop, Booking office & ‘Mares’ Equipment Displays with somewhere that you can eat & drink some of your home favourites whilst meeting people interested in diving and having fun. open daily 12.00 - 4.00 a.m. Happy hour is from 8:30 pm to 10:30 pm. 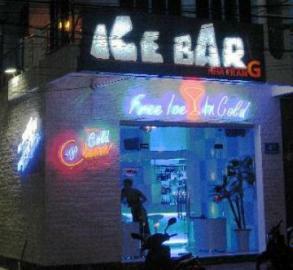 It is one of the most popular bars/discos in Nha Trang and is situated right on the beach. This is the place where people go when other bars in town close. During the day it is rather a restaurant and a bar. It is an open-air bar/restaurant near the ocean. You can order there a real Western breakfast, pancakes, macaroni andcheese, hamburgers as well as the usual Nha Trang seafood selections. The restaurant serves Vietnamese, Indian, Italian and Japanese dishes. It is located in several large huts. Main courses cost VND 65,000-100,000 (US$ 5 - US$ 7). You can also buy or swap a book from their well-stocked rack. There is also an accessory shop, which has many things for you to choose like hat, bag, T-shirt and more. In addition, there even a diving center where tourists can buy swimwear or rent all the neccesary equipments for a local island dive. In the evening the restaurant changes into a bar. It has a huge dancefloor in front of a very long bar. A pool table is also avaliable. Beach front, open air bar has comfortable tables and chairs on the patio. It is very popular among backpackers. The club also has the best music playing in Nha Trang. a mix of pop, dance, latino, reggae or oldies. The real party starts after 23.00. A regular evening involves the beer bong challenge and dancing up on top of the bar. Outside you can admire the ocea and listen to the waves crashing over the sound of the music. Once a month they run a full moon party called Insomnia, but there are also other events. Sailing Club is one of the most famous bars but some tourists had bad experience there. Read the story what can happen in Sailing Club. As the name says, you can buy there beer, but that's not all it has to offer. It is also a great restaurant offering Vietnamese and Western dishes, sea food, pizzas and even Japanese food. It has a swimming pool with sun beds and you can also have fun on the beach. 3 nights every week they have live music around the pool (8.30pm - 11 pm). Open daily 9.00 - 1.00 a.m. It is next door to Guava. An outside patio area leads into the first bar area - behind this are two more rooms including a bar in the back with two pool tables. In this bar you can also buy some food. Crazy Kim Bar has free Wi-Fi internet, but they have a socket only at the bar, so if you plan to use your laptop, you will be able to attach it to electricity only there. The funkiest bar in town. It is centrally located. Guava is full of comfortable armchairs and, in the evening, loud dance music. It has a good reputation as being young and chic. Ocaassionally there are live performances. It is nightclub/bar located opposite Hon Chong's beautiful beach. GMC club is well known as an entertainement paradise with all luxury facilities: discotheque, karaoke, bar, cafe. There are 10 karaoke rooms. In this place you can also eat breakfast, lunch and dinner. Tel: (0084) (058) 527 059. The bar offers a free cocktail from 20:00-23:00 and big cocktail buckets for 20,000 dong. They have a pool table, table football, and a street front seating area. Tel: (0084) (058) 525 599. This bar has happy hour all night long including two for one fosters, with ladies night on Mondays. This places also offers free pool. It is an Irish themed pub run by two Scotsman. Inside are imported beers and cider such as Strongbow. There are several other night clubs more for Vietnamese people than for foreigners. One of them is 007. Tel: (0084) (058) 3811 652. It is one of not many bars open after midnight. This bar is heavily criticised by tourists at TripAdvisor site. It looks that most of the tourists have bad impression about this bar. They complain that they cheat with prices, it is dirty and dangerous. Read stories of tourists who advise to stay away from this place.